Hyderabad: MediaJunction, an expert training institute in Public Speaking announced a fresh batch of Four Day Workshop on Effective Public Speaking. The 199th Batch of 4 Day Workshop on Effective Public Speaking will be held from March 16th and will conclude on 19th March, 2017. It will be held from 6pm to 9.30pm and will be restricted to only 10 to 12 participants on first come first registered basis. For more details, please phone: 98488-42471. MediaJunction has trained so far hundreds of people including some top-notch politicians, legal professionals, school/college students and corporates executive. 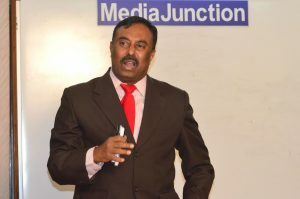 D.Ramchandram, a media consultant and a subject enthusiast will teach how to speak confidently to one person or one hundred. He will help participants improve their speaking and oratory skills. Be it a student, professional, teacher, IT professional, politician and business man everyone needs to talk to people, not only convince their audience in a meeting, but also customers in business/employers/colleagues in profession. This most sought after Training is designed especially for today’s youth, executives, modern day politicians and students who go abroad for further studies or for global employment. They will find the program immensely useful, informed Kalpana, Director of Media Junction. Anyone in the age group of 15 to 60 years of age can join in for SpeechCraft education, experience, and fun!. Four out of ten people have fear of speaking in public. The moment they are asked to get up and speak they tremble, shiver and become nervous. Such people can now get trained in Public Speaking, perform better in job interviews, public functions and whatever the corporate and social environment.